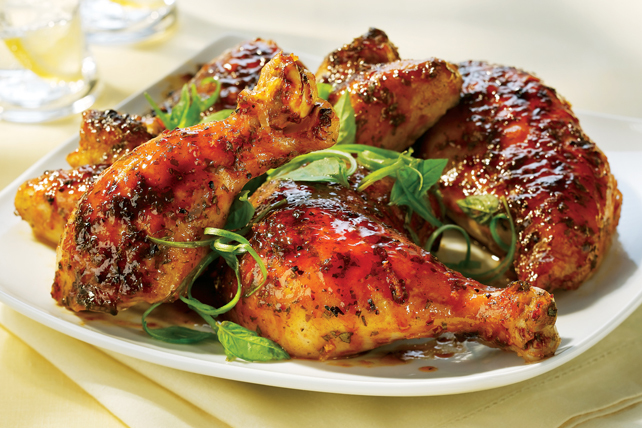 A barbecue favourite, beer can chicken becomes all the more delicious with the addition of DIANA Marinade and BBQ Sauce. Mix barbecue sauce, 1/4 cup beer and half the lemon zest until blended. Reserve remaining beer (still in can) for later use. Mix marinade, fresh herbs, onions and remaining lemon zest until blended; rub evenly over chicken. Sprinkle with pepper. Stack 2 disposable foil pans; place beer can in centre of pans. Stand chicken, tail end down, over beer can. Place on barbecue grate. Grill 1 hour or until chicken is done (165ºF), brushing frequently with barbecue sauce mixture for the last 30 min. Remove from barbecue. Let stand 5 min. before carving and serving. Discard remaining beer in can. Garnish chicken with fresh herbs, such as parsley and basil leaves, and/or an additional green onion, cut into strips. Prepare using Diana Sauce Gourmet Chicken and Rib Barbecue Sauce. Use 2 pairs of tongs to carefully lift the grilled chicken off the beer can to transfer it to the cutting board to carve to serve.